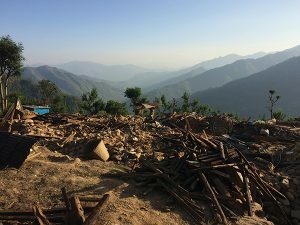 When disaster struck the Nepali village of Karmidanda, alumna Erin Moore was the only doctor for miles. Nepal, the ancient Himalayan country tucked between India, China and Tibet, is a mystical and mysterious place to Westerners. Although Southern Nepal is a hot and tropical river valley, most of the rest of the small country is dominated by the tallest mountains in the world, including Mt. Everest. Known as Sagarmatha to the locals, Everest is just one of many stunning peaks in the region created by the collision of the Indian and Eurasian tectonic plates. In the lore of the Hindu, Buddhist and Bon religions, the mountains and deep gorges are the sacred homes of gods, demons and fairies, created by the conflicts between good and evil. Some, including Tibet’s Mt. Kailash, are considered so holy that climbing “the cosmic mountain” is considered a desecration. It is a region of many myths and legends, including those telling of a giant ape-like creature, the Yeti or Abominable Snowman, and the story of Shambhala or Shangri-La, the hidden city of peace and enlightenment. But in April 2015, whether the work of gods, demons or simply natural forces, the ground shook, twisted and rumbled, laying most of the country to waste and killing approximately 9,000 people. Dr. Erin Moore, a 2014 graduate of NCNM’s naturopathic medicine doctoral program, had been to Nepal before. During her first trip in 2007, as part of a trip around the world, she traveled into the Himalayas, and like many before her, was instantly taken in. “There is something about this place,” she said, “it feels like home when you first arrive.” She returned as a tourist again in 2009, and was on a bus ride to the mountains near the Tibetan border when the bus broke down. Far from any towns or repair facilities, and having no other options, Moore and a fellow American female companion accepted an invitation from a local man on the bus to come to a village where a friend of his lived. The catch: the village of Karmidanda was four hours away on foot. Though both were tired and her friend was skeptical, the pair set out with the villager. All told, she made four trips in five years, including one to help set up a temporary clinic. Other trips saw her leading development projects like building clean water stations, gardens and sanitary services. A family there “adopted” her and gave her a place to stay. She felt a special call to Karmidanda and kept coming back, even as she worked on her medical degree, both to help and to recharge from the rigors of the Western world. A year after graduation she returned again in the spring of 2015 to improve on earlier efforts at the village, some of which had proven unsustainable in her absence. The problem, she had decided during her year away, was that such things as gardens and even modern sanitation facilities were her priorities, not necessarily the villager’s goals. Although she had applied the naturopathic principle tolle totem (treat the whole person) to the village, it was another principle, tolle causam (treat the cause) that inspired her to employ a community development concept called participatory development. 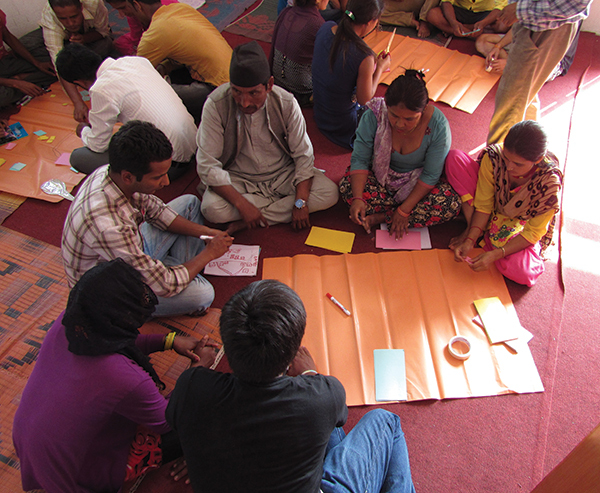 It’s a process where locals identify their needs and take the lead on developing and applying solutions. In a variation on the old “give a man a fish” proverb, the program teaches skills such as assessment and needs mapping, which local leaders then apply to their community. A sense of ownership naturally develops and projects continue after outside aid workers leave. The project was set to begin in a few weeks, but nature had other plans. On the morning of April 25, as Moore and a group from Karmidanda were walking to Katmandu, the Nepali capital, 30 miles away, a powerful 7.9 magnitude earthquake hit. Though she had never been in an earthquake, she knew immediately what it was. The ground rolled and swung back and forth, reminding her of a roller coaster. In addition to the toppled home, in one stroke the village’s clean water supply and limited sanitation facilities were destroyed. Most of the livestock and at least four villagers were dead, with many more injured. Luckily, her host family made it through relatively unscathed. Moore, the brand new graduate of NCNM, all of 31, was the only doctor for miles. The village’s lone clinic was buried in rubble. Fortunately, she had carried a first aid kit and a homeopathy kit along on her aborted trip to Katmandu. Luckily, many of the survivor’s wounds were superficial and easily treated. “I did a lot of cleaning wounds and tried to provide a calming presence,” she said. “The people were so appreciative.” Other people, though, were bleeding, a challenge with her limited supplies. She used dried cinnamon from a neighbor’s kitchen and a native plant called banmara, eupatorium adenophorum, long used in Nepal for cuts and bruises, made poultices and was able to slow or stop bleeding. For bright red, gushing blood, she applied the cinnamon and banmara poultices and administered homeopathic phosphorus by mouth. “That plant saved lives,” Moore said of banmara, “my knowledge of local plants and my homeopathy kit” also proved invaluable. So did her outside contacts, notably boyfriend Nat Willis, a Portland businessman with experience in Nepal, and fellow NCNM grad Desha Wood, ND (’14), who cranked up the social media machine to help raise relief funds from Haiti where Wood was working with Naturopaths Without Borders. More than $30,000 was raised via the YouCaring website, allowing Willis to put together relief supplies, including tin panels for roofing, food and water. The NCNM Clinic donated three suitcases of medical supplies, and the college’s Portland neighbor, the Southwest Charter School, conducted a fundraiser to help. 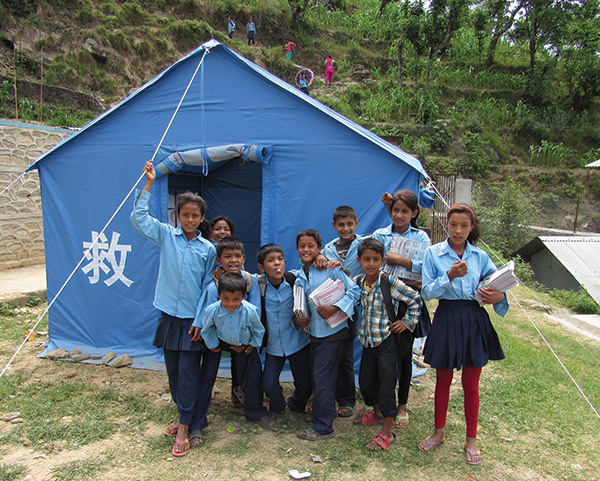 Willis reached Karmidanda five days after the quake. Moore had another thing working for her. The participatory development program she had helped start basically picked up where it left off, with the villagers working on the same basics as before, but with the added help of in-country relief nonprofits. As she put it, “everything had changed and nothing had changed,” referring to the continuing needs and her commitment to stay on until basic, sustainable services were in place. The Spanish Red Cross donated emergency toilets. Blankets and mosquito nets, the latter in anticipation of the coming seasonal monsoons and the potential for malaria, came from YouCaring funds. As a result, the village saw relief much faster than much of the rest of the country, said Moore. The imminent rains gave the whole relief effort a heightened sense of urgency, she said, starting with getting people out of tents and tarp shelters into temporary, but hardier structures of tin and wood reclaimed from destroyed houses. Editor’s Note: ParticipAid is now part of NCNM’s Helfgott Research Institute as an independent project.